Wintery Blues Free iPhone Wallpapers, featuring my watercolor designs! Click the links below to download! Simple, yet Classic with some fresh Winter 2015 flare! To shop these items, simply follow the links below! Red, White + Black Winter Outfit. Mixed Media Illustration by Megan Pizzitola. Fun + Festive Holiday Nail Design in Mint + Gold. Battle cold weather and treat your skin! As the cold and dry weather moves in, I've switched up my beauty routine to keep my skin, hair and hands hydrated. Below you will find my favorite beauty products for winter - and how to use them! How to Use: Apply to dry hands and nails, rub around nails, cuticals and distribute on hands and arms. How to Use: Before applying makeup, or before bed, apply Moisterizer on clean all face, especially on dry areas. How to Use: Rub dime-sized amount in palms and work into hair starting a few inches above bottom of hair, moving downwards focusing on ends of hair. Rub an excess, (or another dime-sized helping) on elbows, hands, knees and feet. How to Use: Apply small dabs to each cuticle and work into nails and all over fingers! Will also brighten and revitalize gel manicured nails. How to Use: Sweep across lips for moisture and playful color tint! Can layer for bolder color while your lips remain happy and healthy! Coming Soon: Holiday Pizzazz 2015 Fashion Collection! Free Seasonal Thanksgiving iPhone Wallpapers, featuring my watercolor designs! Click the links below to download! A few of my favorite beauty products this fall! How to Use: Apply to dry skin anywhere! I love using this product on my cuticles before bed and wake up with soft post manicure hands. How to Use: Spray in sections of hair on a downward motion from root to end. Tousle hair, then blow dry. How to Use: Rub small amount in palms and work into hair starting at the ends, moving up to about 1/2 way to your roots. Use wet or dry: apply before blow drying, or before bed for extra dry ends. How to Use: Apply at pulse points and behind ears for long lasting scent. Free Spooky Halloween iPhone Wallpapers! So grateful to have been featured on Casetify's Instagram today! Click the link below to shop! Mini plant sketches with colored pencils. All of my apartment house plants have been loving the warm sunny weather. It seems like everywhere I look now I see small succulents for sale! I am especially inspired by their size, so I have started working on a new collection of Mini Plant drawings! More to come soon! New Phone Cases available for sale in my Casetify Shop! Fashion print inspired by some girl time this weekend. 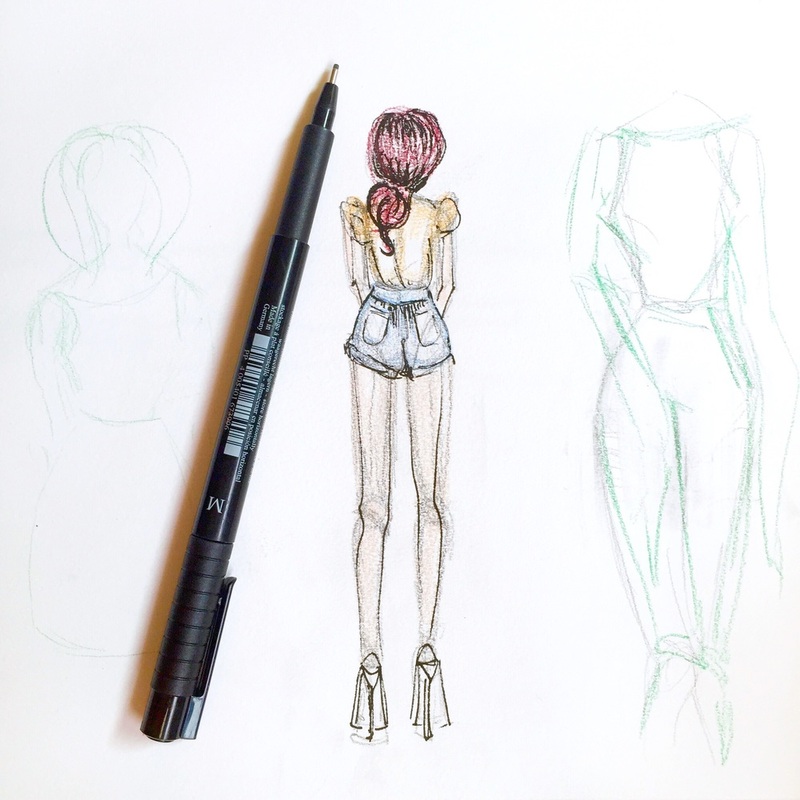 Sketchbook fashion illustration with pencils and ink.